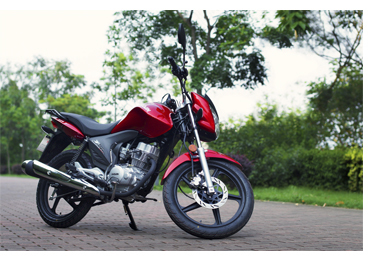 The year 2013 is an extraordinary year for Chinese motorcycle enterprises. Many factors, such as intensified European debt crisis, RMB appreciation, and growing production costs, have adversely affected the Chinese motorcycle industry. In such a grim situation, all enterprises are hesitating to make choices. As an important member in the Chinese motorcycle industry, the Guangzhou Haojin Group Co., Ltd. always adheres to innovation philosophy and constantly surpasses itself. Dedicated to new product development and new technology improvement, Haojin staff have explored a new field on the road of innovation. With years of international technical cooperation, Haojin has won a variety of honourary titles. As R&D experience accumulates, Haojin has applied for more than 170 patents and continuously rolled out new models. In the minds of consumers worldwide, Haojin motorcycles have built the "high-quality and high-tech" brand image. Against this backdrop, Haojin constantly updates its technology platform and high-end R&D engineers, dedicated to provide users with fashion and technology. With joint efforts of Haojin people, the latest model "ZEUS" is now available worldwide simultaneously! ZEUS is equipped with the latest research results of Haojin CBF engine that provides racing power technology. It not only allows a fusion between speed and passion, but also expression of style and personality. Besides, ZEUS embodies all-round technical innovation, energy conservation manufacturing philosophy, and 10 core technologies, constituting the power myth of low-speed high torque, low vibration, low noise, fast acceleration, low fuel economy and wear resistant. ZEUS offers you with anytime anywhere driving pleasure and the enjoyable experience of smooth acceleration.Positioned as a medium- and high-end product, ZEUS is endowed with careful design and excellent power performance. A favourable international market trend also introduces a promising prospective for ZEUS. The appearance of the HJ150-25 ZEUS is tough but highly dynamic and streamlined. The fashionable body adopts an ergonomic design, making riding more comfortable. The 17 L capacity tank allows for a longer travel range. Organic lines perfectly match the dynamic decals, fully demonstrating dynamics and fashion. Bionics design of the crystal headlight integrated with left and right steering lights, making the front more concise and up-to-date. The independently developed automobile-style tricycle dashboard highlights the rider's personality and noble sports car quality. Stepped ridge tail design adds both dynamic and streamlined elements to tough body design. The multi-purpose rear rack is capable of both cargo loading and parking. Racing taillights provide obvious brake warnings, increasing riding safety. The enhanced muffler facilitates muffler and power performance. Black heat insulating coating and anti-scalding chrome upturned plate manifest racing flavour and infinite motion vitality. The all new integrated frame minimises body vibration, building a perfect trip. The successful rollout of the new model ZEUS timely proves Haojin's strength to be a technological leading enterprise. The new model ZEUS has been technically researched a numerous amount of times by Haojin senior engineers: more than 400 hours of bench tests have been conducted on the engine; over 20,000 km road tests and more than 450 three-dimensional data models have been carried out for the motorcycle model; all technologies are based on the highest development standards of Haojin. Aside from some world's top brands, Haojin ZEUS has distinct advantages over high-end products with the same displacement, in the aspects of power performance, comfort, safety and quality assurance. It is definitely a good choice for users pursuing speed and driving pleasure!